Stay updated on developments on the disease. Despite the disease’s confinement to remote areas of West Africa, located at its closest some 4 500 kilometers away from South Africa, the 2014 Ebola outbreak has understandably created fear among travelers to Africa, with many of them cancelling their trips as a precautionary measure. We have prepared this comprehensive information pack on Ebola for you to send to your clients should they be concerned about their trip to South Africa and recommend that you also refer them to the websites of South Africa’s Department of Health (www.health.gov.za) and the Department of International Relations and Co-operation (www.dfa.gov.za) for more information and updates. While the fatality rate of the disease is considerably high, it is not air, water or food borne. Ebola can only be transmitted through direct contact between mucous membranes or broken skin and the bodily fluids of a symptomatic patient. We have every confidence in South Africa’s preparedness, should an Ebola case be positively identified within our borders, as well as in the capacity of our hospitals to quarantine and treat patients. Both Nigeria and Senegal have been declared Ebola-free and it is worth noting that it is only those countries where the health-care system is in a very poor state where Ebola is currently rampant. Additionally, we believe that South Africa’s position of screening arrivals from affected countries and limiting incoming flights from these countries are sufficient for the moment, given that these comply with the protocols and recommendations of the United Nations World Health Organisation. People should appreciate just how big Africa is, and what happens in West Africa, particularly in its rural areas, is really far removed and isolated from the rest of the continent. 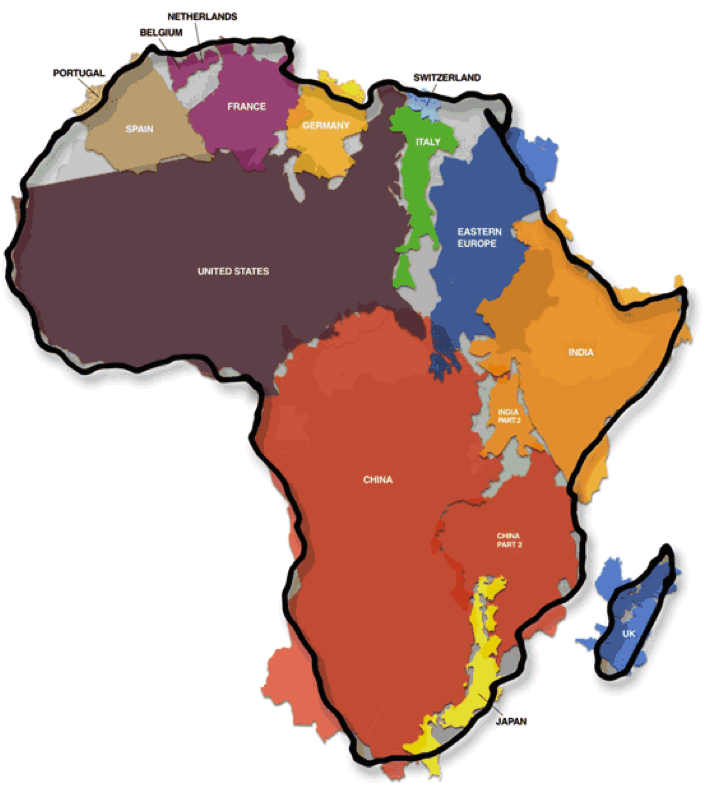 At the end of this information pack is a map of Africa, which will help give it some perspective by showing how many countries can fit into its borders. The World Health Organization has declared the Ebola outbreak an inter­national public health emergency. This is the largest Ebola outbreak to date and will require international support to the affected countries and a coordinated response to control the outbreak and stop further spread. The risk of infection for travellers to the region would, however, be considered low and the WHO has not imposed general trade or travel restrictions either to or from Sierra Leone, Guinea, Liberia and Nigeria. Human infections result from direct contact with the body fluids and organs and blood of infected patients and there is no airborne spread. Persons with confirmed Ebola disease or identified contacts of these patients will not be allowed to travel out of the affected countries. This regulation would not apply to expatriates who become ill while working in the affected countries and who require medical evacuation. There will be exit screening at all borders in the affected countries to detect persons with febrile illness. There are no special precautions or directives for commercial flights, passengers or crew departing on flights bound for or returning to Guinea, Liberia, Sierra Leone or Nigeria. The risk of Ebola being introduced into South Africa remains low. There are a number of measures that have been put in place at South African ports of entry as well as medical facilities in South Africa to identify persons at risk with fever from the affected countries. If after visiting Ebola affected countries and you experience fever, tiredness, headache, nausea, vomiting, diarrhea, cough, immediately call your medical centre and tell them about your symptoms and travel history. There are eleven designated hospitals for handling suspected cases of Ebola in the country. Travellers in Africa are reminded of the malaria risk and the need to take preventative measures and to always consider malaria in the event of the occurrence of fever. · Ebola virus disease, or Ebola hemorrhagic fever as it was previously known, is a rare but severe disease, found in countries in Africa, which can often have a fatal outcome (for 25-90% of the infected people). · The first documented outbreak of Ebola virus disease occurred in 1976 in the Democratic Republic of Congo, at the time known as Zaire, and all subsequent outbreaks have been in Africa. · In most cases, an infected person experiences sudden onset of fever, weakness, muscle and joint pains and headache, followed by progressive weakness, lack of appetite, diarrhea (sometimes containing blood and mucus), nausea and vomiting. The initial symptoms are unspecific and are similar to other more common diseases such as the common cold or malaria. · The next stage is more severe with bleeding from the nose, gums and skin, and bloody vomiting and stools. Other symptoms include skin rash, inflamed throat and difficulty swallowing. · It can take between 2 and 21 days from the point of infection for a person to begin to show symptoms. · A person can get infected with the Ebola virus by direct contact with infected blood, secretions, tissues, organs or other bodily fluids of dead or living infected persons. However, the risk for transmission in general is low in the initial stages of symptomatic patients. · It is transmitted by droplets and not in the air, so it is highly unlikely that someone would be infected with Ebola virus disease just by coming into casual contact with someone already sick, such as sitting next to someone (and without any direct contact of bodily fluids). · Most people are infected from another person but some people have been infected with it from handling dead wild animals or 'bush meat' in Africa, such as chimpanzees and bats. · People only become infectious once they start to have symptoms. The risk of being infected in the early phase of symptomatic patients is generally low. · The risk of infection is much higher in the later stages of the disease but can be effectively addressed with the proper use of appropriate personal protective equipment. · The case fatality rate – the proportion of people diagnosed with the disease who die – is 25-90% dependent on the virus type. · The Ebola virus is susceptible to disinfectants and bleach and is destroyed by heating. · There is no approved vaccine at this point but research is ongoing. · There is no specific treatment that is approved for general use against Ebola virus disease but supportive treatment – hospital care to relieve symptoms and to prevent further complications and side effects – can be given. · Ebola viruses are thought to circulate in wild animals in sub-Saharan Africa. They have been found in fruit bats, chimpanzees, gorillas and duikers, and human infections have been linked to direct contact with such animals. · An outbreak of Ebola virus disease can be stopped by breaking the chain of transmission. This can be done by isolating suspected and confirmed patients to prevent onward transmission. · At the same time, people who have been in close contact with patients are also contacted and monitored to identify possible infections. · Check with your national authorities for travel advice on whether to travel to a country affected by an Ebola outbreak and other health information, including access to healthcare for reasons other than Ebola virus disease. · If you develop fever, muscle aches, weakness, headache and sore throat, you have been in a known affected area, having had contact with blood, secretions, or other bodily fluids of living infected persons, you should seek rapid medical attention also mentioning your travel history.